GRAVENHURST — A noisy student protest against education cuts today should worry Doug Ford as much for the sound of honking horns as the shouts of young activist teens who “worry” about their future in Ontario. More than 100 Gravenhurst High School “walkouts” paraded two blocks up to the main street to be seen and heard for 45 minutes in front of the Opera House. They were doing their part in a province-wide protest that saw BMLSS students march on MPP Norm Miller’s downtown Bracebridge constituency office. In Huntsville, Parry Sound and Almaguin, similar scenes played out on a sunny, but cool spring Thursday, April 4, afternoon. 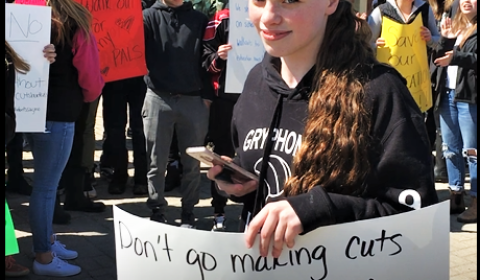 Sage van Kooten, one of the organizers of the GHS walkout and protest, said she was very happy with her schoolmates’s response. With chants of “Ford wants cuts — students say no,” and “Education is a right. We will not give up the fight.” And signs that read “We want a say” and “We want outcomes, not income$” the GHS students loudly cheered themselves. And almost all of the drivers who slowed to look showed support by putting their hands on their horns. Sage van Kooten, one of the student organizers, was “very happy” with the turnout — which was between one in three or one in four kids in the student body of about 350. She thanked the students and said she was proud of them for turning out in such large numbers. She said it came together rather quickly after she attended a Forum for Young Canadians conference last week, where the class walkouts were widely talked about. “That hugely inspired me,” she said while rallying her troops. So she came home and signed up her school online, forming an instant Instagram site. She was among a dozen male and female students who spoke up and spoke out. They shared around a small blue megaphone and took turns telling schoolmates that the PC government cuts mean fewer teachers and programs like music, cuts to tech and arts, and OSAP funding. It’s a particular concern for small school, with an arts bent and few resources and educational tools to begin with — and that’s just on the teaching side of the equation. Several showed no reservations about getting up before their peers to stir them up with rousing chants and heartfelt stories. “It worries me,” said Grade 11 student Grace Stein, who wants to go on to study auto marketing and is also concerned for her Grade 7 brother, who wants to take auto body in two years. Grade 10 student Lilly Kersnik, another organizer (along with Kiara Collins — victory lap), also expressed concern for her brother about the four mandatory online courses. She said he can’t learn easily on his own and needs a classroom setting with a teacher to help him one-on-one. Alesha Graydon, 17, a Grade 11 student, said OSAP changes make it difficult for those with large families to get an advanced education. At the appointed hour of 1:15 p.m. more than 100 students left classes and gathered their signs for the march uptown. Others, like Morgan Douglas, a Grade 11 student, said increased class sizes won’t be good. Students said some teachers they noticed earlier in the day wore at least a piece of black clothing, the recommend rally colour, in solidarity. Although, most students didn’t. Friends Tory Sheppard and Nicole Trott said their focus was on how slashing funding would affect the student athletes who are on the girls hockey team. The two are lucky, they’re teammates on the Orillia Huskies hockey team. But for other kids, school sports are all they have left. It’s their only athletic avenue. “They help the students, not just with their classes, but in life, too,” said Trott. They cited their English and French teachers, who also coach boys and girls basketball, and who helped free them from a difficult group of bully-type students. For some of the students this was their first time demonstrating, but they all acted and sounded like already-seasoned protesters, smiling, carrying signs and screaming on demand. Mike and Dave, who asked that their last names not be used, held up a sign with Ford’s picture. Dave, who said it was his first foray in civic unrest, said the sign represents his three protest priorities: specialized school priorities, free tuition and Indigenous culture funding cuts. Hailey Speicher, who volunteers as a co-op student in her school and at the GPS kindergarten next door, was teary-eyed when she spoke after about the loss of educational assistants for those students. She said she has seen so many children begin to grow up and do so well, noting in particular kids on the autism spectrum. She plans to be a youth and child care worker one day. Grade 12 student Kaitlyn Schofield, too, questioned the Ford cuts. The students returned to classes in time for their final fourth period, after being marked as absent, and having learned a valuable life lesson they may not have gotten had they not walked out of period three. Two police cars were seen circling the block — with one momentarily pulling over at the protest site — before the peaceful demonstration. Click on the comment button to tell us how you feel about cuts. The front court of the Opera House was full of students this afternoon, who wanted a say in their education and future. And they got it. Once uptown, the students were made their point with speeches and a mix of poignant messages for Premier Doug Ford and his PC government. The walkout began like any student protest, with optimism and enthusiasm, as students poured out of the school doors ready to be seen and heard. The march of more than 100 GHS students stretched the two blocks from the Gravenhurst High Schooll up Sharpe Street to Muskoka Road. Sage van Kooten leads the students to the Opera House, where they assembled and made their concerns heard loud and clear. Mike and Dave share their protest priorities during the demonstration Thursday afternroon. Social media was well used in promoting the protest and urging a public sharing using the #cuts hurt kids hashtag. Black was the colour du jour, with students signalling their displeasure with the government. A dozen or so students got stood up and gave impromptu and personal speeches admonishing the Ford cuts. With a little encouragement, most drivers passing the protest honked their horns in solidarity with the GHS students. Students stayed at the Opera House’s Heritage Square chanting and protesting for 45 minutes before returning to school.